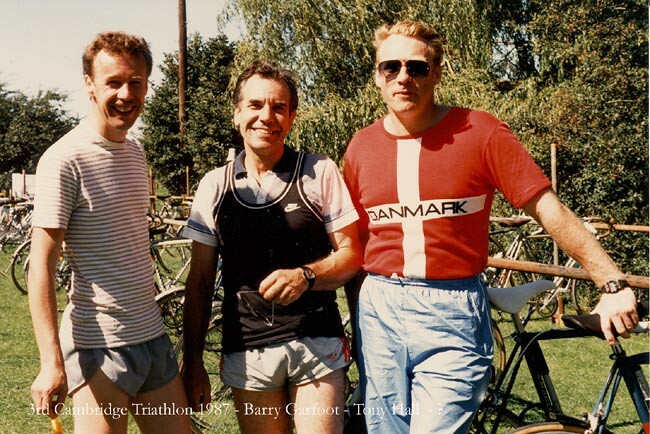 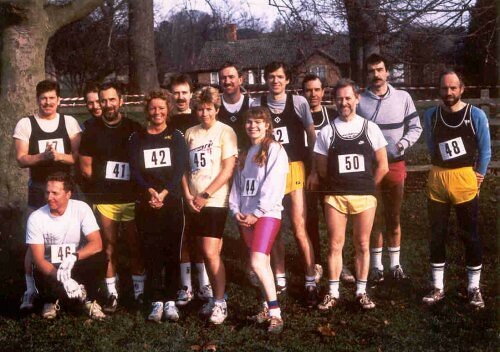 Cherry Hill, Ely, 1990 ER Team. 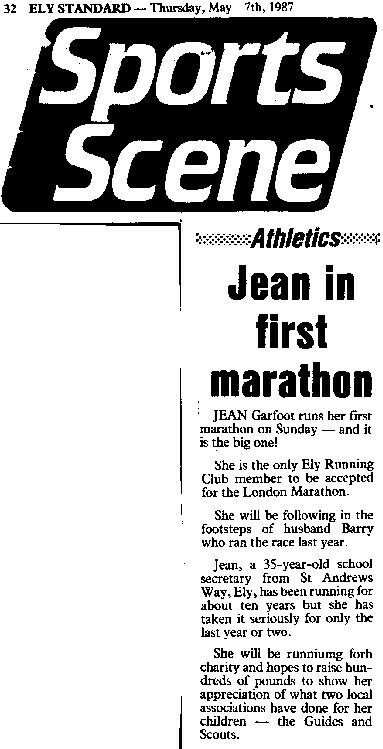 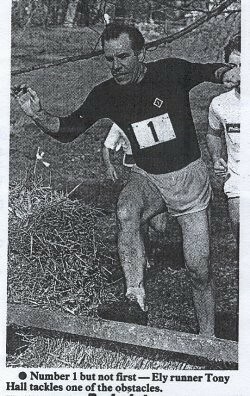 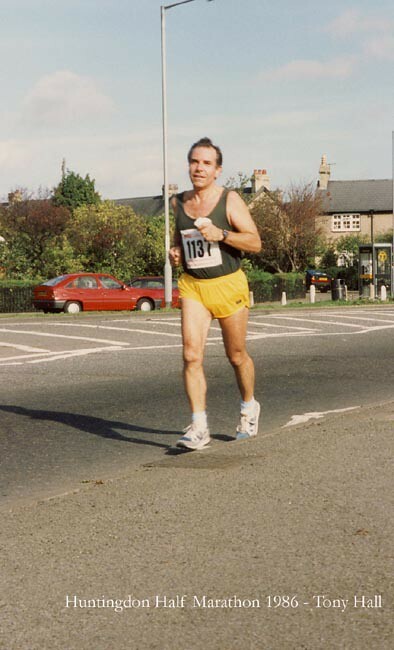 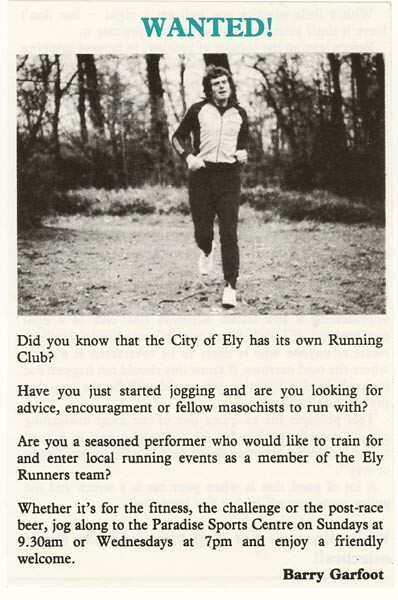 1: 'Dennis of Grunty Fen' a self-appointed comic character who was very popular at the time (hence invited to be the 'Starter') but was in reality Radio Cambridge DJ/folk singer Peter Sayers (since died) & the father of Goldie Sayers the Olympic javelin thrower. 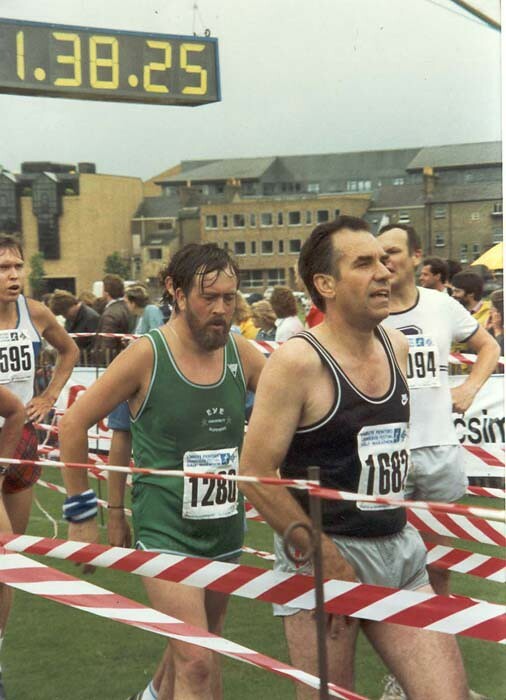 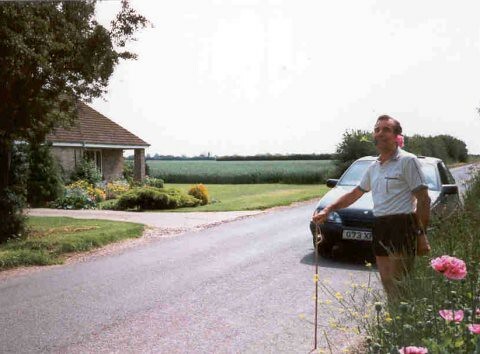 2: Lester Millbank of Radio Cambridge interviewing JT 'on air' - the start was broadcast. 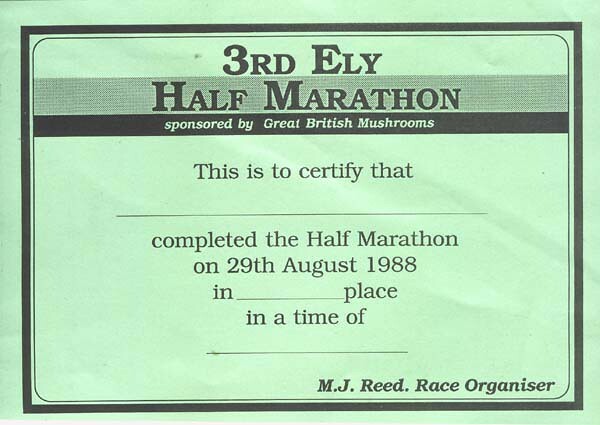 Annoyingly it was delayed whilst they finished playing a record. 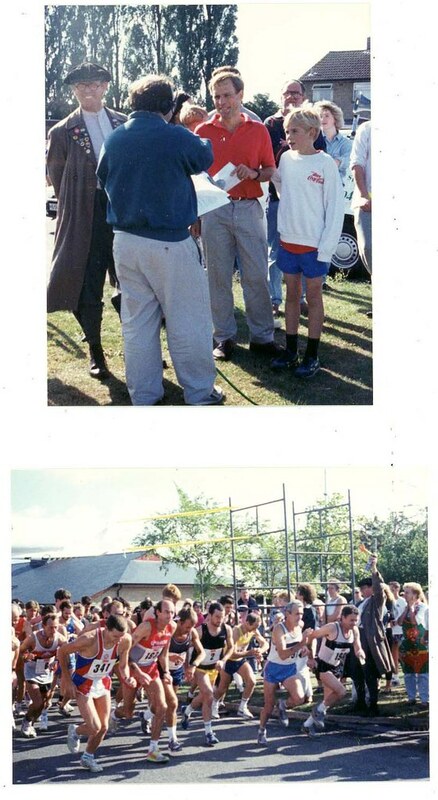 They weren't asked again! 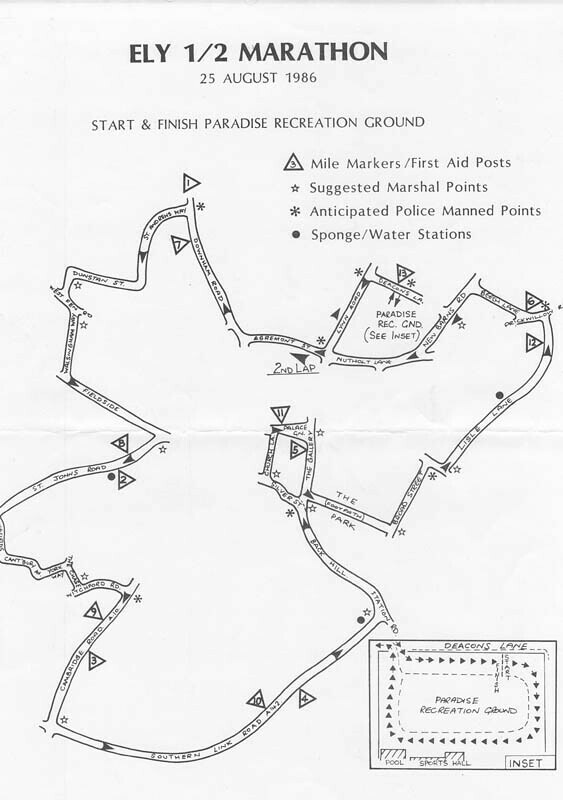 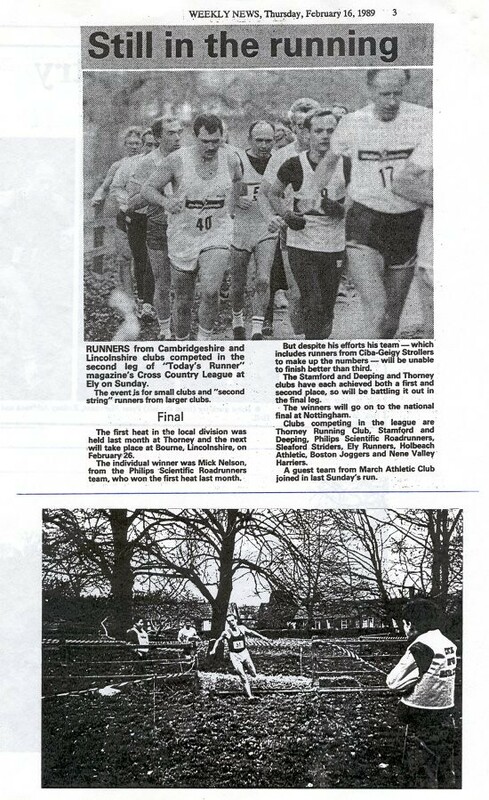 Cherry Hill & Deans Meadow course - Sunday 17th February 1991. 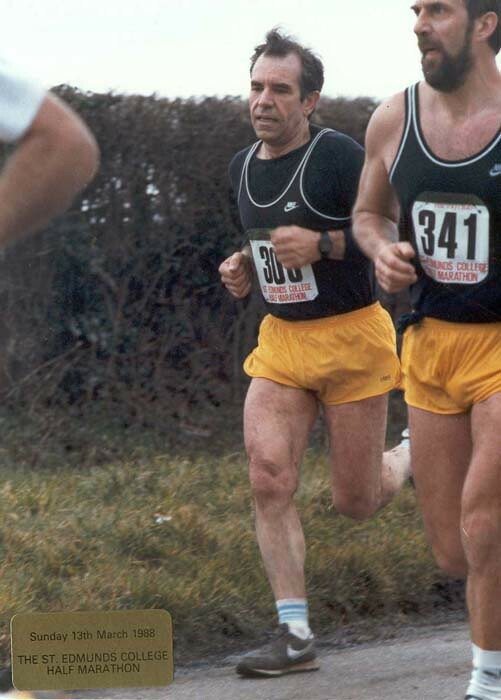 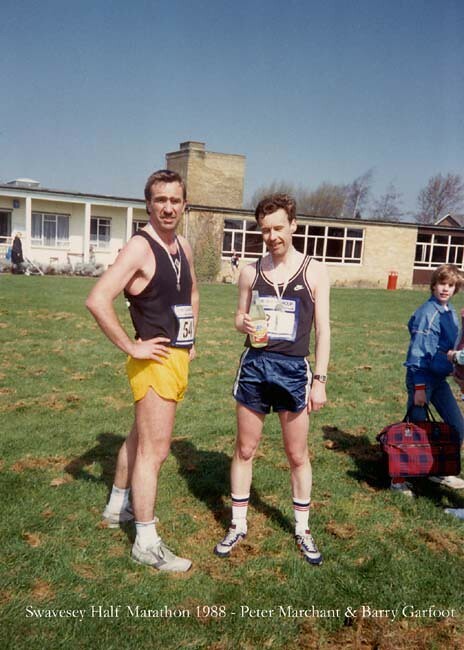 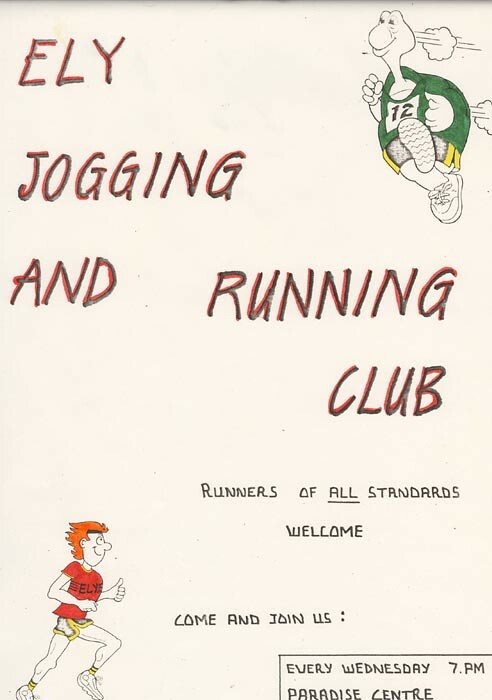 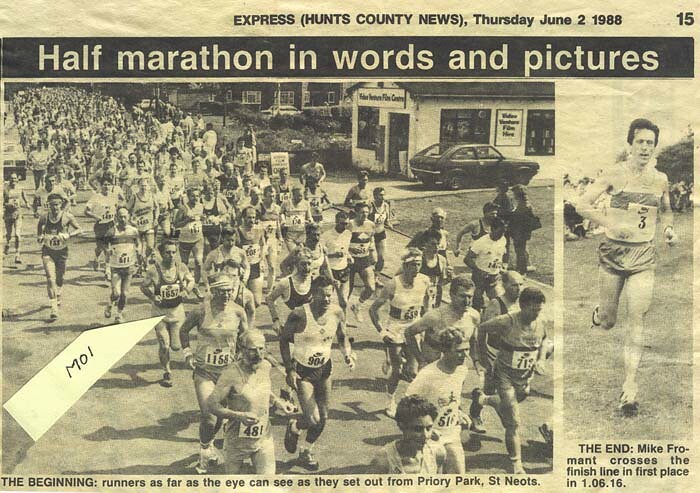 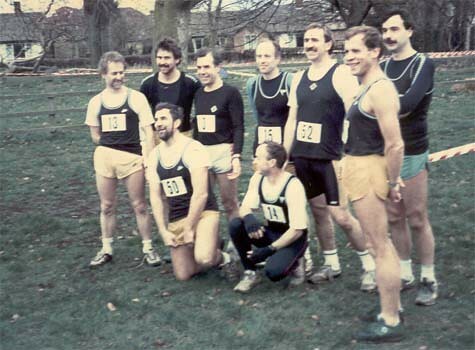 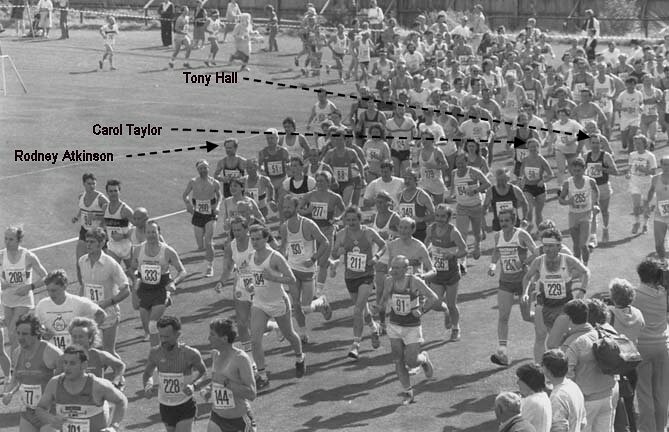 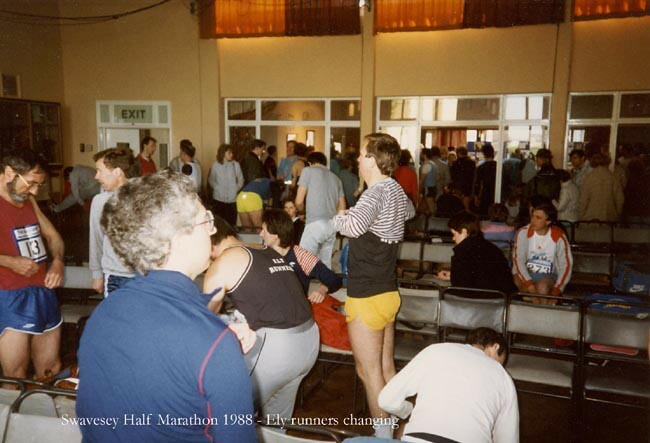 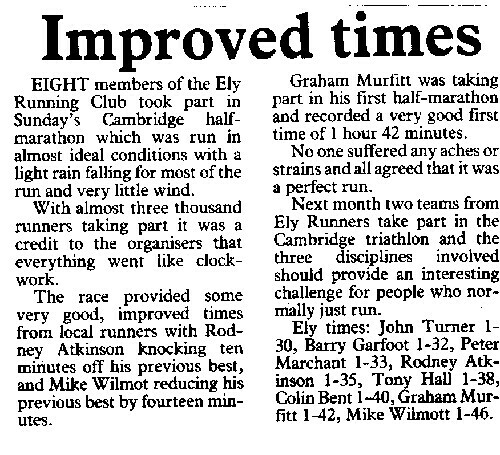 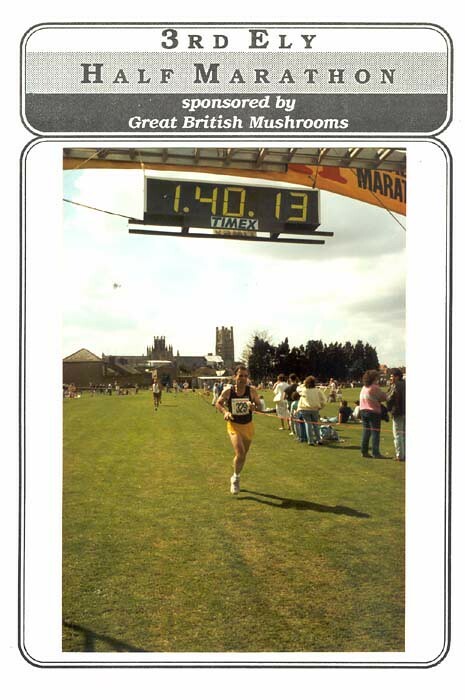 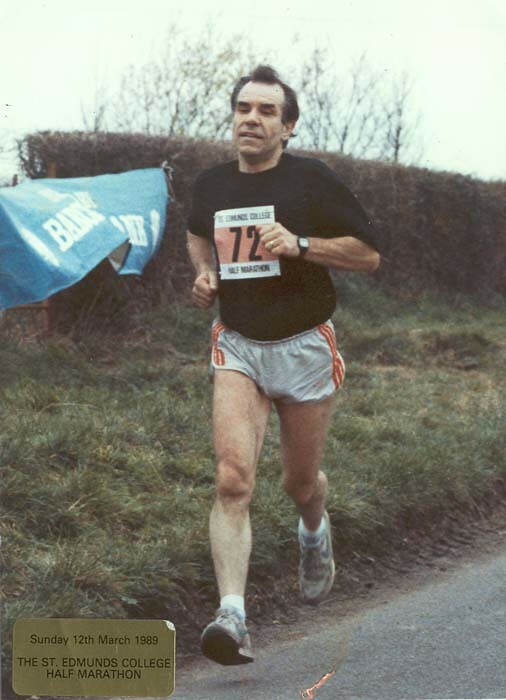 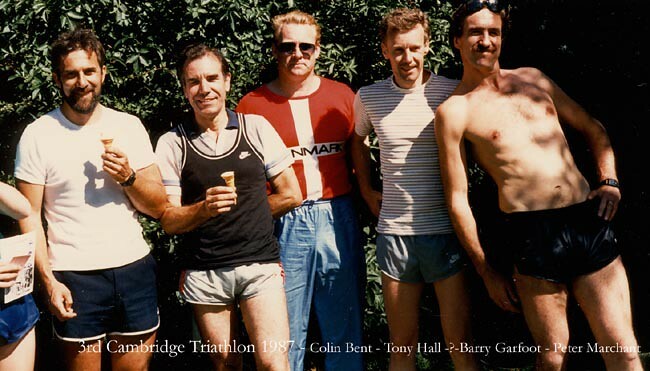 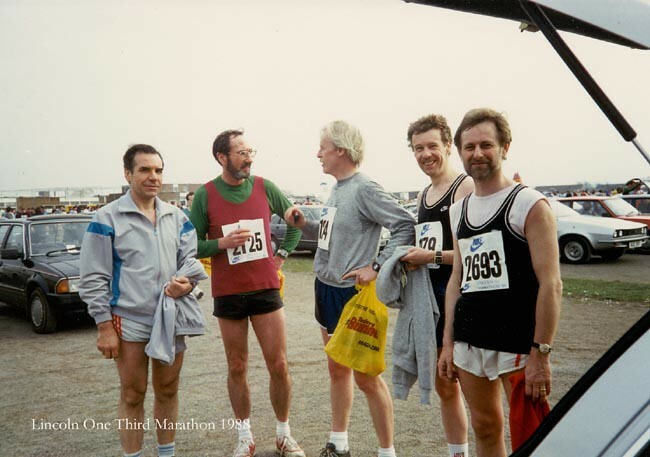 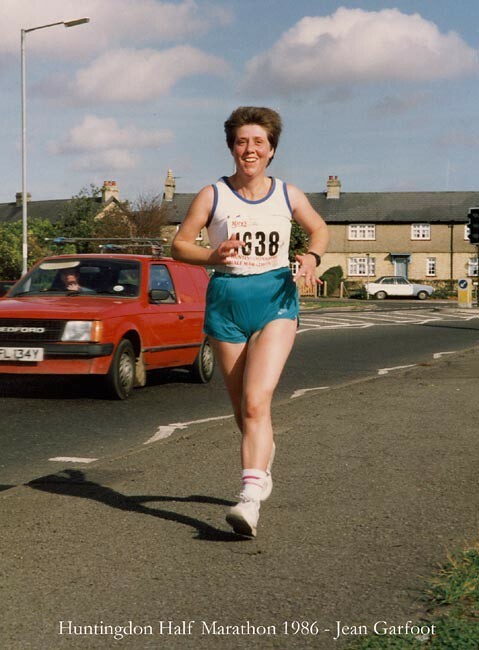 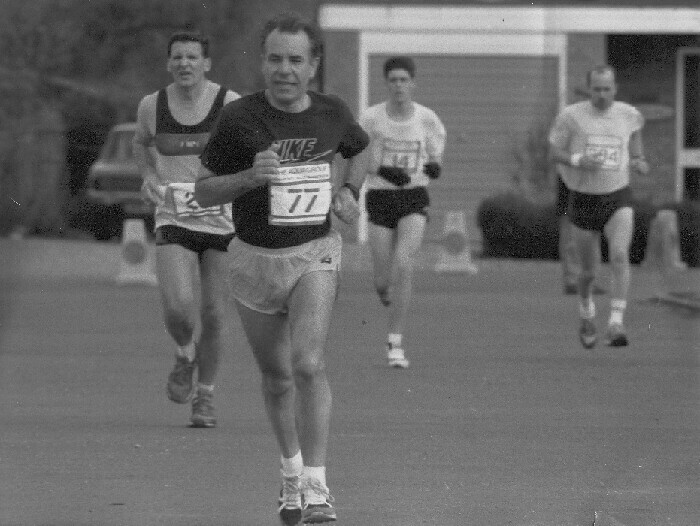 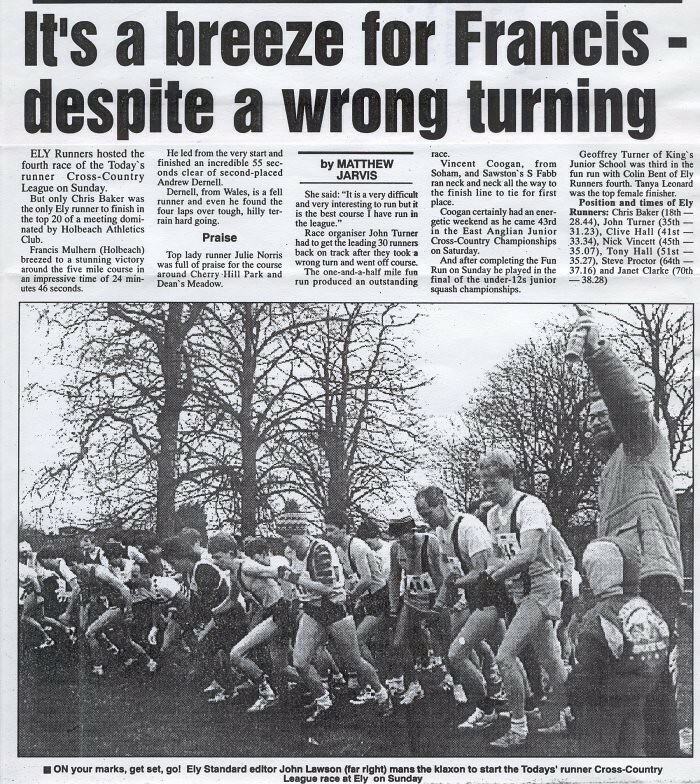 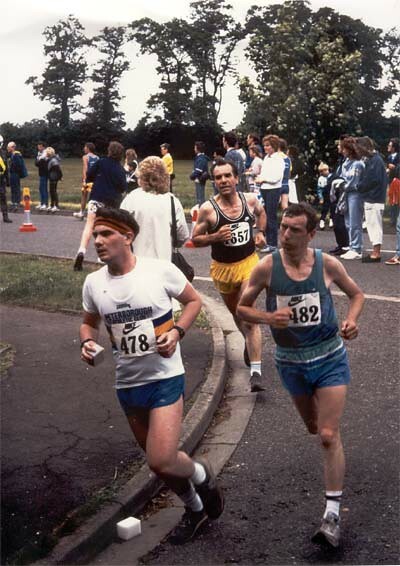 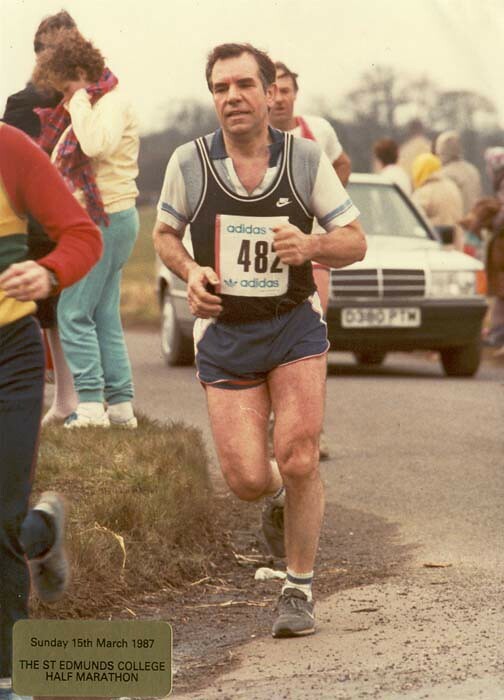 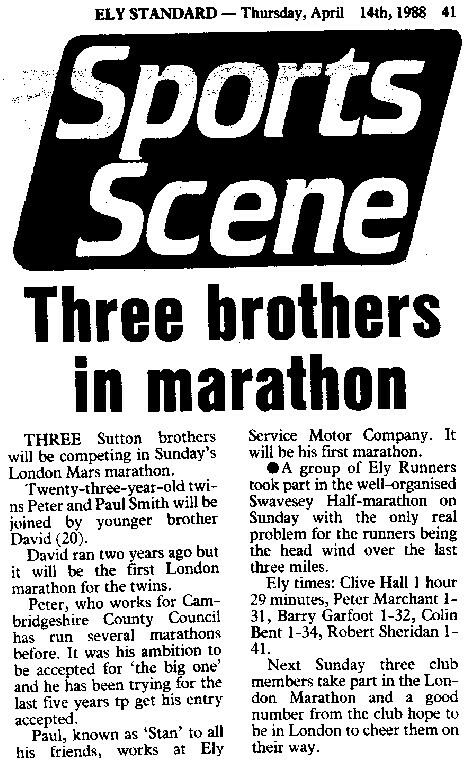 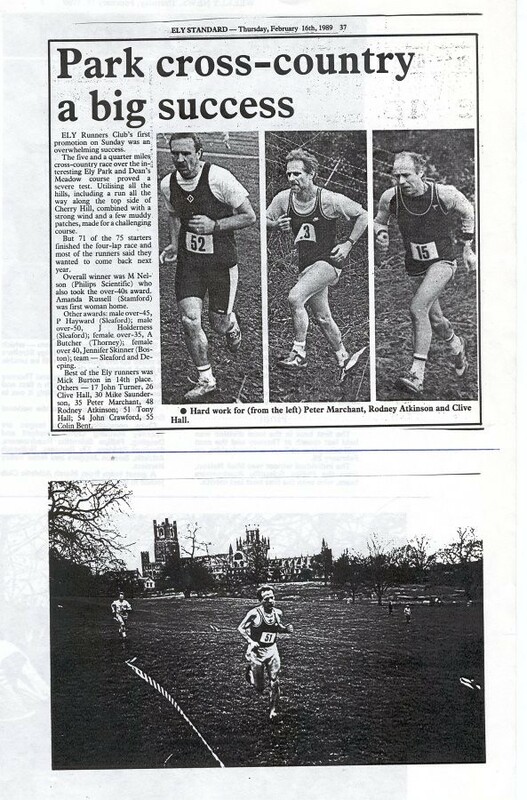 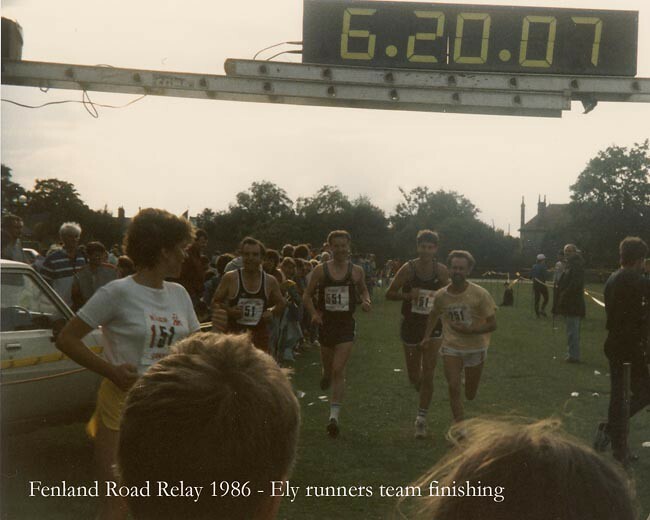 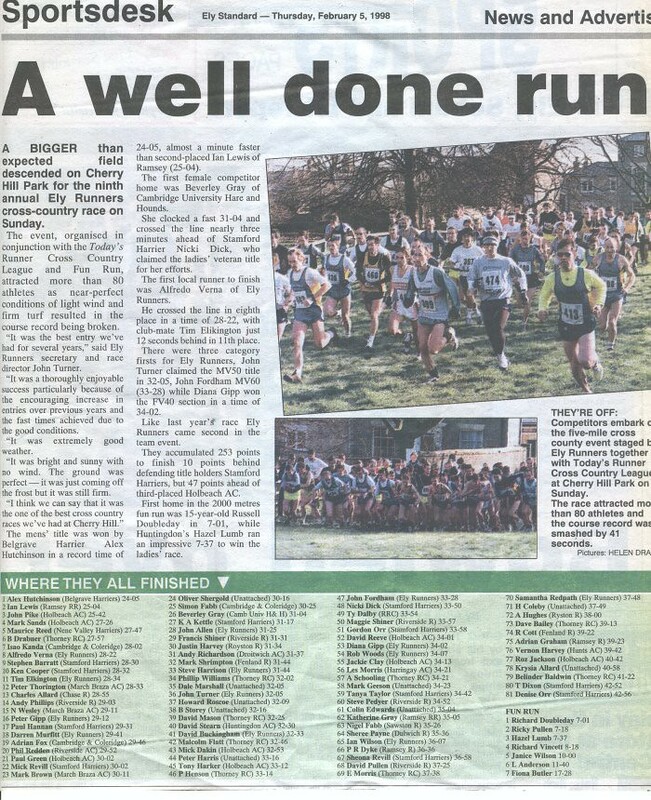 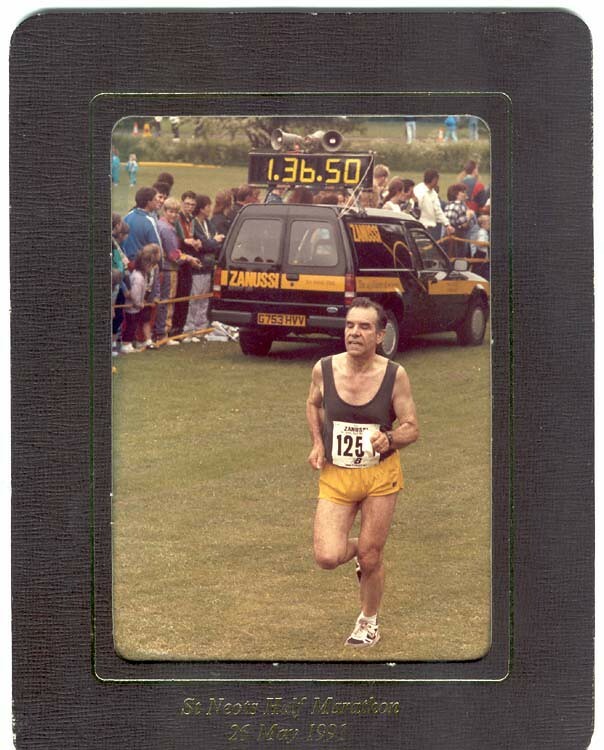 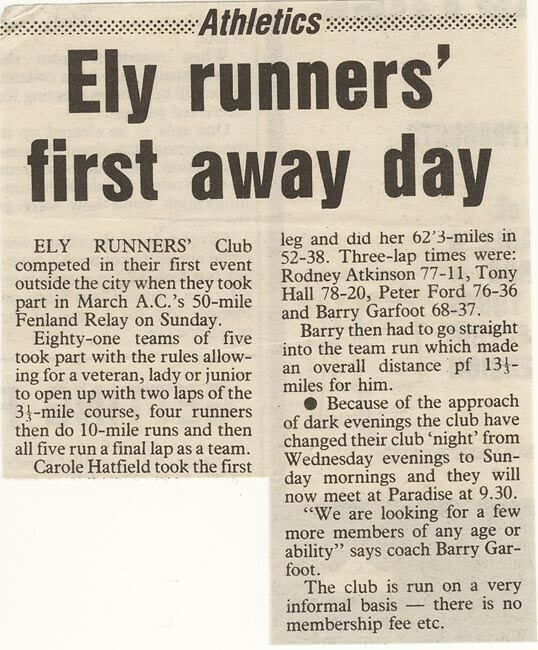 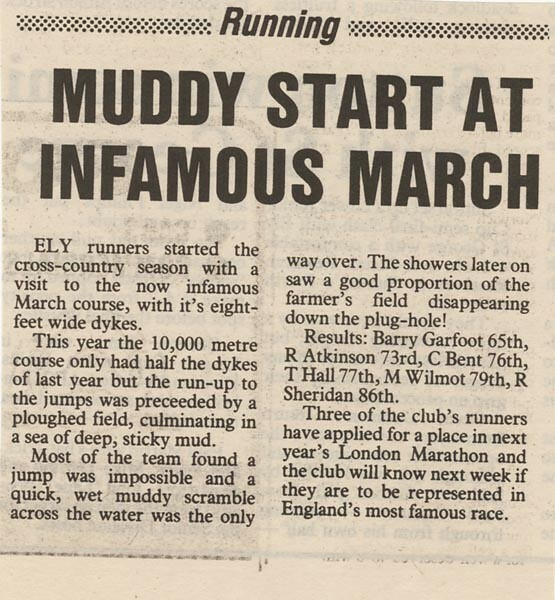 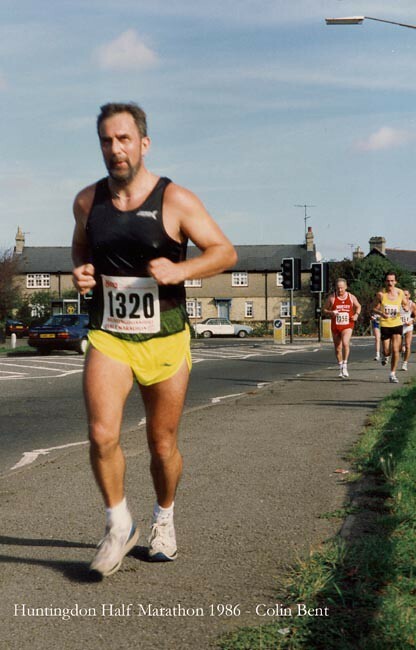 Steve Proctor 47, J McMahon (crouched), Nick Vincett (face), Colin Bent 41, Carol Taylor 42, David Buckingham, Mandy Cave 45, Peter Marchant, Liz Lambert 44, Chris Baker 52 (1st Ely Runner, 18th), Tony Hall, Rodney Atkinson 50, John Crawford, Clive Hall 48 There were 92 runners & Ely Runners were 6th of 6 teams! 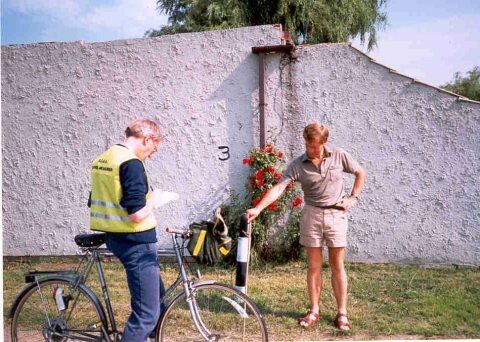 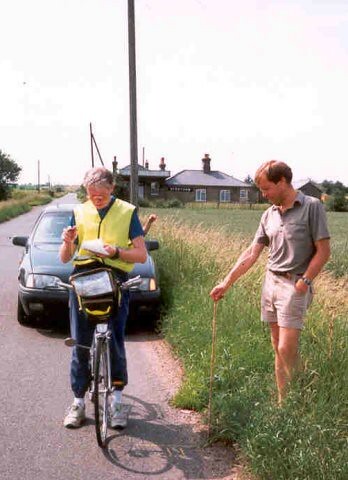 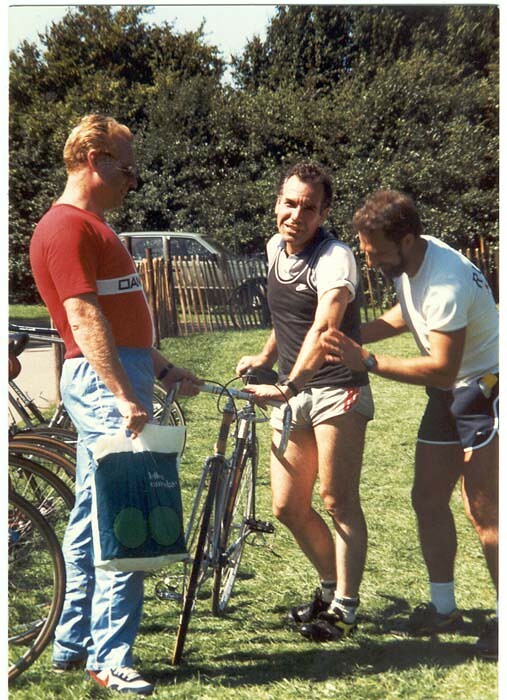 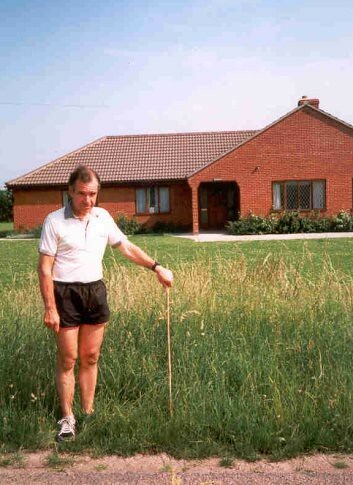 Tony King Official SEAA Course Measurer. 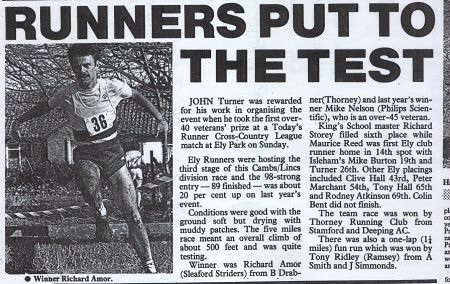 John Turner assisting.